Dr Mike Biddle, President and Founder of MBA Polymers, the world leading multinational plastics recycling company was yesterday, (4th December), awarded the 2012 Gothenburg Award for Sustainable Development. 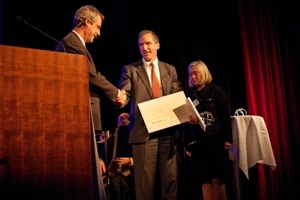 The award was made at a presentation in the City of Gothenburg Concert Hall. The theme for this year’s Award was ‘closing-the-loop. In comparison with nature’s eco-cycle in which waste products are of value in new processes, society’s current use of materials is unsustainable. Only between 5-10 per cent of plastics in the world are recycled. Raw materials are converted into products and eventually become waste, leading to resource shortage, waste problems and energy waste. Entrepreneurship and new innovative solutions are required to break this trend and instead create functioning eco-cycles. The award this year was made jointly to Dr Biddle and Bjorn Söderberg the founder of the Fair Enterprise Network, which develops responsible companies in Nepal in the area of sustainable waste recycling. Mike Biddle commented, “It’s a great honour to be selected by such a renowned international jury and even to be on the same list of people of past winners such as Kofi Annan and Al Gore is a terrifically humbling experience. I started the business from my garage in San Francisco almost 20 years to the day and who would have thought that we would have achieved such recognition in that time. What a great way to celebrate our 20th birthday! My personal congratulations also go to Bjorn. We are both on a similar journey, but in very different ways!” MBA Polymers Chief Executive Nigel Hunton commented, “This is a great honour for both Mike and MBA Polymers. Over nearly 20 years we’ve now grown to become the world’s leading multinational company recovering plastics from end-of-life durable goods, such as computers, electronics, business equipment, appliances and automobiles. With 300 million pounds a year processing capacity across the world in the US, Europe and China, turning waste into recycled plastics, we are now really starting to ‘make a difference’ and close the loop in this important environmental and economic area. Last week we were recognised as ‘Company of the Year’ at the annual GoingGreen Silicon Valley event held in San Francisco. We believe that recognition signifies leadership amongst our peers in bringing game-changing approaches and technologies to the market.” The Gothenburg Award winner in 2011 was former UN Secretary General, Kofi Annan. Amongst previous winners were Al Gore (2007) and the former Prime Minister of Norway and Director General of the World Health Organization, Gro Harlem Brundtland (2002).